The art of good conversation is a skill that all should aspire to gain. When we are able to be confident in talking to whomever we need to, the world just becomes a lot nicer place to be. Recently the Toastmaster magazine had some very good suggestions to becoming a better conversationalist that I’m going to share. Express a sincere interest in the other person. Asking someone about themselves is the easiest way in the world to start a conversation. And the person who actually listens to the answer is usually considered a new friend. Ask meaningful questions. Ask the person to tell you what they think about a topic, event, or news item. Avoid controversial topics or ones that you’re just looking for someone to give your opinions to. Ask something that requires more than a “yes” or “no” answer. Give compliments. There is always something nice you can say and no better way to attract the undivided attention of someone than to give a flattering remark. You can admire something about their appearance or home, compliment the food they prepared, or their work on a project. Listen. Respond and listen. A big part of successful communication is responding appropriately, and how can you do that when you didn’t her the previous comment? Avoid debates. Allow other people to have their opinions. Stay away from historically volatile topics like religion, politics and other controversial topics. A poor communicator talks on and on. Be careful to not be a one – sided communicator. We can all improve on our conversation skills. And they are skills. You can practice and improve on them. Everyone can. Start by going out to lunch with a friend and make a point to use some of the suggestions. Each time we practice, we get better. And pretty soon you’ll find you’re the one that people gravitate towards because you make it easy for them to be comfortable in a crowd. In fact, join the Main Street Lunch Mob and have your perfect opportunity to practice! We meet once a month, January it is on the 16th, at noon in the front room of Pub on the Bricks. 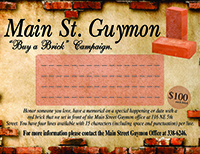 We just gather together and support our Main Street Guymon restaurant members. Come alone, bring a friend, it doesn’t matter. It’s Dutch treat and the $5 lunch special is always popular when we go to the Pub. And you shouldn’t miss the Guymon Lions Club Chili and Stew Supper on Jan. 16. Lunch mob in the afternoon and hit the Chili Supper in the evening at the Methodist Enrichment Center, 6th and Quinn, from 5:30 – 8 pm. Plates are $7 for adults. This is a great way to assist those who do so much for our community. Another chance to practice your conversation skills is at the TCEC Co-Op Connections Spotlight on Thur., Jan. 11, at Charles White Insurance. The spotlight happens from noon to 1 and when you go, you can sign up to win $100 in Main Bucks! The Co-Op Connections is a great way for you to save money at many local businesses. Check it out at www.tcec.coop. That evening don’t miss the chance to watch the OPSU Men’s Basketball team play in Goodwell at 8 pm. It’s a great evening to watch them. They also play at 5 pm on Jan. 13. Love to see you on the bricks!